These headsets are comprised of stereo headphones and microphone with a volume control on the 2.0m long cable. 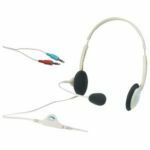 Used by a huge number of educational establishments throughout the UK, these headsets are perfect for use in a learning environment, internet cafe's etc. PLEASE NOTE: Current remaining stock is BLACK, not BEIGE as in the photo. Apart from colour change all specifications, details and appearance are exactly the same.